Our meals all meet Australian Food Safety Standards with a special focus on balanced nutrition. 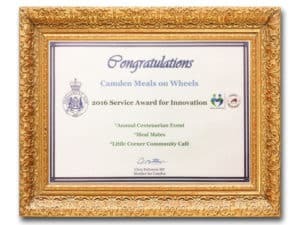 The current Camden Meals on Wheels menu has over 108 items, which includes meals (both main and mini size), soups, desserts and juice. We have hot, chilled and frozen meals which can be stored for convenience. People can order order a meal: online, by phone, in person, by email, fax, or hand it to the volunteer. We really do try and cater to our clients’ needs and make the process simple. Generally meals are delivered between 10:40am and 1:00pm depending on how many people are on the delivery run. 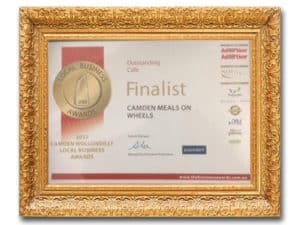 We currently have five different quality meal suppliers. We can texture-modify meals (puree or chop) as required. Our menu is continuously reviewed. The chilled menu changes twice a year in conjunction with Winter and Summer seasonal changes. The frozen menu is reviewed throughout the year and is changed as required by demand or preference of our clients. Meals are subsidised by the Australian Federal Government (Dept of Health for Aged Care) and NDIS is (Department of Social Services). The prices advertised on our menu include the subsidy discount.